South Africa's Oscar Pistorius suffered a surprise defeat in the 100m final at the IPC Paralympic Athletics World Championships in New Zealand. 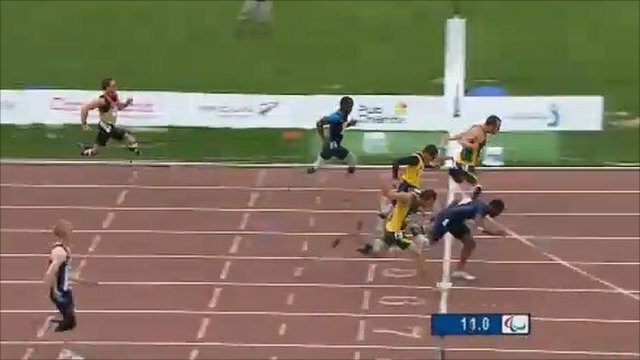 The double amputee, known as 'Blade Runner', was edged out by Jerome Singleton of the United States in a photo finish. It was a first international defeat in seven years over 100m for Pistorius. There was British success with gold medals for discus thrower Danny Greaves and wheelchair racer Dave Weir. Pistorius has been one of the dominant forces in Paralympic sport since winning his first major title in Athens in 2004 and is set to be one of the faces of the 2012 London Games. But Singleton, who is a single-leg amputee, was confident of getting the better of the South African, having finished second to him in Beijing in 2008, and made the better start. He led after 50m but Pistorius drew level and Singleton fell over the line together with Pistorius, neck and neck in a photo finish but it was Singleton who got the nod in a time of 11.34 seconds. "There's a lot of me that won't be leaving New Zealand," Singleton said referring to his dramatic dive for the line. "But it was all worth it." Pistorius, who won gold in the 200m earlier in the week and is favourite for gold in Saturday's 400m, paid tribute to his rival. "He [Singleton] was the better man on the day. He has been improving all the time and he is a champion in the making," said the South African. 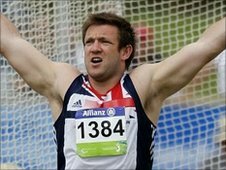 Greaves, who won bronze at the Beijing Paralympics in 2008 after winning gold in 2004, set a new world record of 58.98m for his third successive world title. The 28-year-old from Leicester, who was born with a foot deformity, finished over five metres ahead of the rest of the field. "I was really confident going into the competition and I was a bit annoyed to post two no-throws in the opening three, but I re-grouped and told myself to stick to what I do in training and I was so much more relaxed after that," he said. "Maybe I was trying a bit too hard in the opening rounds. I wasn't turning like I had been in training but I managed to put it right." "I lost my way a bit after finishing third in Beijing but I re-focused and this win stands me in good stead for London. "I thought I had a 60m throw in me today, but it'll come." Weir clinched his second gold medal with a flawless display in his 1500m race, beating world record holder Marcel Hug of Switzerland into second. Hug took an early lead but the pace slowed on the second lap with Weir in third behind the Swiss racer and Jordan Bird of the US but as they hit the bell, Weir pushed through on the outside and went on to win. "I didn't expect Marcel to go to the front so early," said Weir of Hug's break into the first bend. "I sat behind him but I was struggling until I got into my rhythm." "I always want to perform at major championships and I feel great to be honest," said the double world champion, who goes in the 5000m on Thursday. "You get the hunger for gold, of course you do, and for every one I get, I want another one." Elsewhere, there were silvers for Tracey Hinton in the T11 400m and three-time Paralympian Hazel Robson in the T36 100m while newly crowned world 200m champion Katrina Hart had to be content with 100m bronze in her T37 event and there was also bronze for wheelchair racer Mickey Bushell in the 200m. Northern Ireland's Michael McKillop set a new 1500m world record in his T37 category but with only two entrants, there were no medals awarded.